In my last post I touched on getting to the cloud, which can be a challenge if you’re not using the right tools. Metalogix, Sharegate, and AvePoint are all recommended solutions, and you won’t go wrong using any of these. But for now, I’ll leave their pros and cons for a future post. 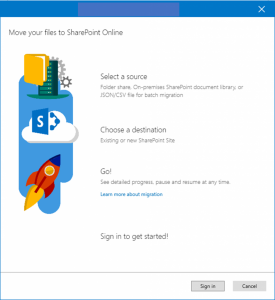 In this post, I’ll be focusing on Microsoft’s offering in this space: the Microsoft SharePoint Migration Tool. The key advantage of this tool? It’s Free! For all the SharePoint Admins out there who get the “We don’t have budget for that…” response all too often, Microsoft has provided at least one option that can’t get rejected due to price. In January 2018, Microsoft announced the general availability of the migration tool. We had a couple migration projects going at this time, so I looked to see if the Microsoft tool could be a viable alternative to Metalogix. At the time, the Microsoft tool wasn’t able to help me move a list from source to target in a migration from SharePoint 2010 to SharePoint online, so I quickly stopped and went back to Metalogix. By May, however, Microsoft had announced v2 of its SharePoint Migration Tool – with list support! Now I’m interested. This only works with SharePoint 2013, though, so it’s still not going to help me with my 2010 clients, but it’s good to have for those on 2013. Remember, this is a FREE tool. The SharePoint Migration Tool lets you migrate lists or files from your SharePoint on-premises document libraries or from your on-premises file shares and easily move them to either SharePoint or OneDrive in Office 365. It is available to Office 365 users. Designed to be used for migrations ranging from the smallest set of files to a large-scale enterprise migration, the SharePoint Migration Tool will let you bring your information to the cloud and take advantage of the latest collaboration, intelligence, and security solutions with Office 365. The UI is clean and simple. Sign in to your target tenant, then select the source from a file share, from a SharePoint 2013 site, or using a JSON or CSV file if you have many sources and want to perform a bulk migration. As of the date of this post, the Microsoft SharePoint Migration Tool is made only to move content. It only moves lists and libraries from SharePoint 2013 sites; it cannot “Copy Site” like Metalogix, Sharegate, or AvePoint. If you are migrating files from a file share, you will not be able to map metadata to the file as you move the content to the target library. You can copy permissions by creating a user mapping file. If you need to close the migration tool before a submitted job has completed, you can restart the tool from any computer. Also, with the latest version, PowerShell command can be used to move files from SharePoint 2013 on-premises document libraries and list items, or file shares, to Office 365. All the functions in the UI can be scripted and controlled. Local storage or Azure Storage can be used with the migration. I recommend going the Azure storage route if you have lot of content. This will make the task go faster, and it won’t take up free space on your local disk. I have been working with SharePoint for over 10 years, and it always amazed me that Microsoft did not have a migration tool before now. Sure you have PowerShell, but even with that, the user community had to get involved and create the PNP PowerShell commands. I am happy to see this and happy to see the speed at which they have added new features. Hopefully they keep up the development pace. If you’d like to help them improve the tool, you can – and should! – add your feedback to SharePoint User Voice. It’s Free! What do you have to lose? If your migration is simple – mainly focused on moving content into SharePoint Online – I would start with Microsoft’s free tool. If you have a more complicated migration and need some assistance, give us a call – we are happy to help. At Olive + Goose we have a team of skilled and experienced Cloud Architects with years of experience ready to assist – reach out to us today.